Rose Evelyn Boroff, 87, 803 Dingman St., Sidney, Ohio died at Wilson Memorial Hospital in the emergency room of an apparent heart attack at 1:25 AM on Wednesday, March 12, 2008. She was born June 2, 1920 in Sidney, Ohio the daughter of Raymond and Pearl (Barker) Schmidt. They are deceased. Surviving are five children, Geraldine Brown of Sidney, Ohio; Darla Sever of Sidney, Ohio; Eugene Boroff of Troy, Ohio; Margie Ferguson of Sidney, Ohio and Michael Boroff and wife Pat of Sidney, Ohio; 30 grandchilren, 41 great-grandchildren and 9 great-great grandchildren. Two brothers, one grandson and one great-granddaughter are deceased. 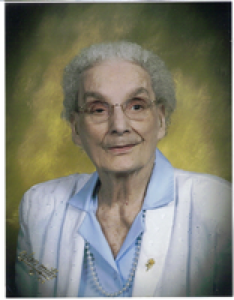 She was an avid reader and liked to travel on various trips that the Sidney Shelby County YMCA offered. She was a member of the First Church of the Nazarene, Sidney. She had worked at Fair Haven Shelby County Home as head cook and retired in 1979. Prior to that she had worked at Big Smitty&#39;s Restaurant and Stolle Corp. in Sidney. Funeral services will be held at the First Church of the Nazarene, 1899 Wapakoneta Ave., Sidney, Ohio on Friday, March 14, 2008 at 11:00 AM with Rev. Chad Wilson. Burial will be at Shelby Memory Gardens, Sidney. Friends may call at Salm-McGill and Tangeman Funeral Home on Thursday, March 13, 2008 from 5-8 PM. Memorial contributions may be made to the First Church of the Nazarene, 1899 Wapakoneta Ave., Sidney, Ohio 45365. Envelopes will also be available at the funeral home.